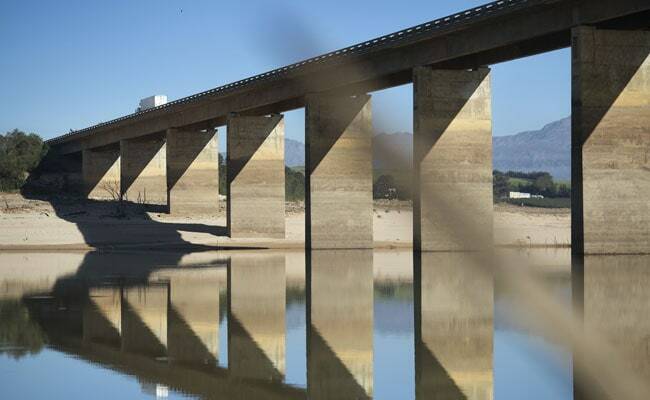 Theewaterskloof Dam near Cape Town now has less than 10 per cent of its water capacity. Cape Town: As Cape Town suffers its worst drought in a century, residents have been told to restrict showers to two minutes and flush toilets only when "absolutely necessary". The city - South Africa's biggest tourist hotspot - and the surrounding Western Cape province have been declared a disaster area by the local government, with just 10 per cent of usable water left in the dams supplying the area. At the local watersports club, exposed moorings reveal where sailboats once floated. The long slipway now ends about 30 metres (100 feet) from the water's edge. "I've worked here for about 20 years and I've never ever seen the dam this low," club secretary Lise Wheeler told AFP. "The best strategy to manage a drought effectively is to manage demand, which is what we are doing," city councillor for water Xanthea Limberg told AFP. Some Capetonians have taken to collecting their own water at a natural spring outside a brewery in the city. Many are convinced that with dam levels so low, the quality of tap water has declined - a rumour that the city has been battling for months. "This is the only drinkable water I can get," one resident told AFP. "What we've had now is three seasons in a row where the rainfall has been low, and that's a one-in-a-hundred-year occurrence," Johnston told AFP. "Even if we get a real wet winter, those dam levels are only going to go up by about 40 to 50 percent," Johnston said. "If we get regular good rainfall, we're still going to be pretty much in the same position this time next year. That's the scary bit." "This means that even if the situation stays the same in terms of population size and water usage, the long-term future is for less water falling out the sky," Johnston said. "Restrictions are going to be a reality for the foreseeable future," Limberg said.